Right from my first phone call to Oyster Worldwide I felt confident that we were going to have a fantastic trip and we were not disappointed. Firstly we met Basant in Kathmandu who ( along with his wife and staff ) was so warm, welcoming and enthusiastic about the experience we were about to have. Kathmandu was busy and full of sounds, sights and smells . We had a lovely day just walking around acclimatising and soaking up the atmosphere, and buying paints to decorate the school we were going to. The next day we travelled 3 hours on bumpy, dusty roads to the village we were going to stay in. The scenery was magnificent and we were briefed about our stay. On arrival at the school we were met by our host and the Deputy Head who spoke a little English. We were so touched by the welcoming ceremony and all the children coming shyly up to have a look at us. 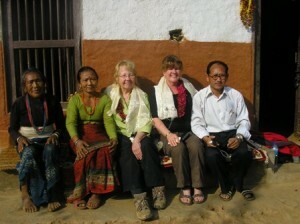 We then went to meet our host’s wife and mother who spoke no English but we got by with expressions and gestures. We stayed in their mud house and tried to live as they did. The views from the house were stunning. They got up at 5 am to collect water as the village tap is only on between 5 and 7 am. Breakfast of ginger tea and sometimes a delicious round doughnut was at 7 am and then lunch of vegetable curry was at 9 am. After this we walked to the school for 10 am. Our hosts wife worked everyday carrying large loads of manure on her back to a field several miles away and returning with a basket full of leaves for animal feed. In the evenings neighbours would come to meet us before having supper and then bed at 8 pm. We loved painting the classrooms and bonding with the children and teachers, who were so excited to see the posters and teaching aids that we had brought. We met up with some women’s groups in the village and tried to help with healthcare advice. This proved difficult as these people have so little and advice given has to be practical and possible. They didn’t seem to be aware that they could use salt for cleaning wounds etc which was one thing they all had access to. Tea was had some afternoons in homes of the teachers. We loved every single day and laughed so much and felt so welcome .We were struck by their sense of community and how happy they all seemed. They are really trying to help themselves but need a helping hand from other people such as being taught life skills. People either leave to go to the city or farm the land which is incredibly hard , back breaking work. We gained so much by being with them that we cant wait to go back. Everything was simply wonderful ! 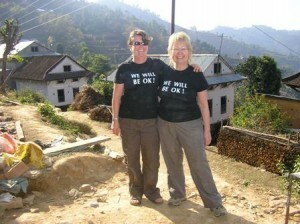 Thank you so much Margeret and Nicky, we are so glad you enjoyed your time in Nepal! Previous Post Why take a Gap Year Volunteering in Tanzania?